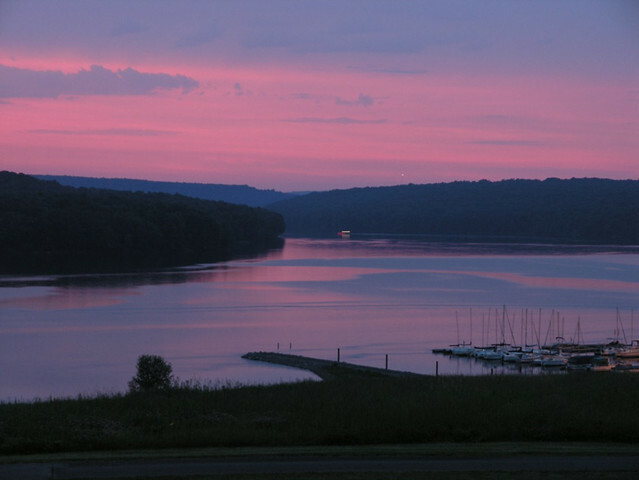 At Prince Gallitzin State Park, the forested hills of the Allegheny Plateau cradle sprawling Glendale Lake. Vistas offer scenic views of the 1,635-acre lake with its 26 miles of shoreline, which is a favorite of anglers and boaters. Campers flock to the large campground and also enjoy hiking and other outdoor activities. The varied habitats of the park make it a home for many types of wildlife, and a rest stop in the spring and fall migrations. Prince Gallitzin State Park is in northern Cambria County and is reached by PA 36 and 53 and US 22 and 219. From US 219, at Carrolltown, turn onto SR 4015. At Patton, take US 36 east to Glendale Lake Road. From US 22, Cresson Exit, follow PA 53 north. From PA 53, turn at either Frugality or Flinton. At Frugality, following State Park Drive/Marina Road will take you into the major day use areas of the park. From Flinton, Beaver Valley Road will also take you into the park and is a more direct route to the campground. From I-99, Exit 32, follow PA 36 west, turn right at Ashville onto PA 53 north. An environmental education specialist offers a wide variety of environmental education and interpretive programs year round. Through hands-on activities, guided walks, and programs, participants gain appreciation, understanding, and develop a sense of stewardship toward the natural and cultural resources of the park. Recreational programming includes interpretive kayak and pontoon boat tours of Lake Glendale. Curriculum-based environmental education field learning experiences are available for K - 12 school groups, youth organizations, and homeschool associations. A two-plug, electric-vehicle charging station is available for public use on the lake side of the parking lot in the marina. Please move to another parking space once your vehicle has been charged.